A study finds that food allergy is initiated when the following elements occur all at once. This involves skin exposure to food from those providing infant care, skin exposure to allergens in dust, use of infant cleansing wipes that leave soap on the skin, and the genetics that alter skin absorbency. In my opinion, it gives us a step in gaining more information of how food allergy begins early in life. About 4-6% of children in America are influenced by food allergies. The prevalence of reported food allergy increased 18 percent among children under age 18 years from 1997 to 2007. Recent data also show hospitalizations with diagnoses related to food allergies have increased among children. Luckily, the risks can be greatly reduced from customizing a few simple habits in our very own homes. This includes washing our hands before handling the baby and less frequent use of infant wipes that leave soap on the skin. Use water to rinse the soap off. 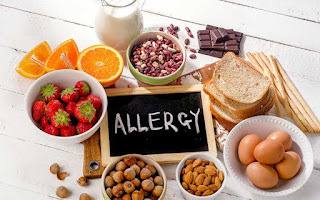 Clinical evidence presents up to 35 percent of children with food allergies have atopic dermatitis and a great deal of that is clarified through at least three different gene mutations that downgrade the skin barrier. Cook-Mills utilized a neonatal mouse model with skin barrier mutations and attempted exposing its skin to food allergens such as peanuts. The peanuts alone had no effect. The top skin layer is composed of lipids (fats), and the soap in the wipes interrupts that barrier, Cook-Mills explained. Skin problems that happen with skin barrier mutations may not be noticeable until long afterwards a food allergy has already initiated. The neonatal mice with the mutations had normal-appearing skin, and the dry itchy skin of dermatitis did not form until the mice were a few months old, comparable of a young adult in human years. After the neonatal mice got three to four skin exposures of food and dust allergens for 40 minutes in a two-week period, they were fed egg or peanut. The mice had allergic reactions at the place of skin exposure, allergic reactions in the intestine, and the serious allergic food reaction of anaphylaxis that is quantified by lower body temperature. In patients with skin-barrier defects, there are alterations in the proteins in the skin that are caused by mutations in the genes. These gene mutations in patients are mainly heterozygous, which means there is a mutation in one of the two copies of a gene. Accordingly, in the preclinical studies, neonatal mice were also heterozygous for skin barrier mutations. The mice were co-exposed to food allergens such as egg and peanut proteins, allergens in dust (house dust mite or Alternaria alternata mold) and sodium lauryl sulfate, a soap present in infant cleansing wipes. For additional information, refer to the original article. For additional information, click the link of the journal for the mechanism for initiation of food allergy.